We're back for our 11th season... and this time it's BIGGER and better! This spring, summer... and fall, the Laff Boat has a great schedule of national comedy headliners. Some are new, hilarious national headliners but most are the favorites that packed the cruises last summer. 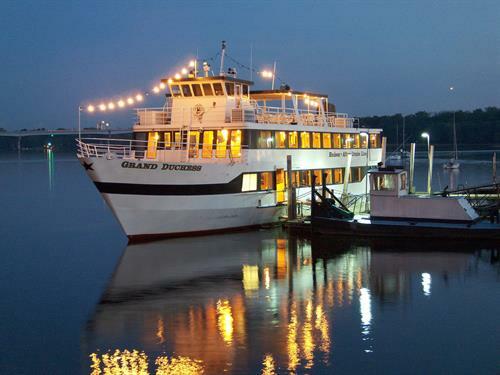 Enjoy Dinner and Comedy during a breath-taking 2 hour and 15 minute cruise down the scenic St. Croix River. Enjoy the scenery while you savor a tremendous meal prepared by the chefs of the Historic Afton House Inn. Jeff Gerbino left radio to start a comedy scene in the Twin Cities, where there hadn't been one previously. Some of the names he recruited to work with him include; Louie Anderson, Jeff Cesario, Joel Hodgeson and Stephanie Hodge. As a comedy club headliner, Jeff worked with the following comics [as writer and performer]; Jimmy Walker, Michael Keaton, Kevin Nealson, Roseanne Bar, Tom Arnold, Paula Poundstone, Robin Williams, etc. Jeff has made appearances on Good Morning America; Entertainment and Comedy Central. * Cash bar only! WE DO NOT accept credit cards or checks on the boat! Boarding is in Hudson, WI. The actual boat used for your cruise will be determined by St.Croix River Cruises and is subject to change without notice.